I hope you've had a great weekend! It is cold and rainy here this afternoon, but despite the weather, this time of year I start craving all the lighter foods that come with warm, sunny days. Recently I put together this salad and it has quickly become one of my favorites. At the time I had some lettuce and fresh strawberries and thought I would combine them together in a salad with a few other staples I had. What resulted was a light, fresh salad with just the right combination of sweet and tangy. Not to mention it's easy and quick to put together! When I make a salad as the main course for a meal, I always add some chicken. Sometimes I marinade it and other times (when I'm either in a hurry or I was too lazy to marinade earlier) I simply rub in a little extra virgin olive oil and sprinkle it with freshly ground black pepper and sea salt. Whenever I make this salad, Jillian always gets excited. I think there's just something about the strawberries that adds just enough sweetness to make it both refreshing and delicious. You can adjust the quantities to your own preferences, but I usually load ours with the strawberries and chickpeas. Now I can just hardly wait until we have local strawberries to buy! Warm, spring days are around the corner, I just know it (smile). We began our first day of spring by dyeing some Easter eggs. I've always wondered about using natural dyes... this year I decided to give it a try, but I didn't buy anything special. I just told myself we would use whatever we already had. It kind of felt like a science experiment... some of it worked (frozen blueberries and tea bags), some of it (red wine vinegar and lettuce) not as much. But I will say this... it was fun. Next year I think I'll try it again, but maybe then I'll actually follow some recipes (smile). After I set up a little work station and put all the dyes in jars, Jillian did everything else on her own. I sat in the background distracting Rosetta with blueberries and wondering how it was possible I had a little girl old enough to dye Easter eggs without any help. Once we finished, we couldn't help but put all the eggs in a basket to admire, particularly the egg with the smiley face that Jillian drew with a crayon. The adorable grain sack bunny garland hanging on the window was a surprise for my girls from Ann of On Sutton Place when she sent my last grain sack pillow. She suggested hanging it in the playroom, but it was way too cute to hide away. Sometimes I think about hanging a curtain here, but then I always reconsider. Somehow being able to look out the window with an unobstructed view of our yard and being able to watch the sunset in the evening always makes washing dishes more enjoyable. I hope beautiful, sunny spring days are in your forecast! We returned from a little trip to South Carolina this weekend to some of the first signs of spring. I went with a friend, our four girls and my mom to a homeschool convention and we had a great time! Today we were back to our Monday routine, along with getting the house back to normal and somewhere around six loads of laundry. We had rain and thunderstorm warnings all day, but somewhere around dinner time the sun came out and afterwards we all ran outside for a breath of fresh, (almost) spring air. Forsythia bushes are in full bloom and Bradford Pears are covered in white blossoms... the birds are chirping and the days are getting warmer... I think spring is in the air! Huck might need a haircut. The chicken house in progress. Thank you to all who entered the giveaway for the amazing grain sack package that Ann from On Sutton Place put together. I know we both appreciated each and every lovely comment! The randomly drawn winner of the giveaway is Cristi Copeland! Congratulations! I thought it was about time to share some photos of our living room! We've been slowly (since last August - yikes!) making some improvements to the room and it's so nice to check another room off our list. The living room was the first room we entered when we looked at our house. I'll never forget the feeling that came over me. We rarely get snow here, but there was snow on the ground and it was near Christmastime. Yes, we immediately saw improvements that needed to be made, but instantly I felt like I was home. It was warm, comfortable and well, cozy. Fortunately, our home really was move-in ready, but there were certain things we knew we would eventually fix. One of those things was the styrafoam tiles that covered the ceilings downstairs. Although we've had wonderful luck in other rooms of our house finding the original beadboard in good condition, when we removed the tiles in this room, we instantly knew there would be no way we could salvage it. I think this picture about sums up a room renovation in an old house - not fun! The original owners had nailed 1x4 boards onto the ceiling before installing the styrafoam to ensure the room was level. But in doing so, the ceiling height was significantly lowered and every time we walked up the stairs, we had to duck our heads. So it was very important to us to keep the original ceiling height, even though we knew we would be dealing with leveling issues. We installed planking on the ceiling and it was a job. I even learned how to use a nail gun because Justus had to use all his strength to hold the planks together. Even after we finished installing the planks, Justus then had his work cut out for him with the trim. In the end though, we were able to raise the ceiling about 4"! I know I've mentioned before, but just in case you are new to reading, the walls are oak tongue and groove and are original to the house (about 80 years old). They have never been painted and it was important to us to leave them as they would have originally been. We replaced the ceiling, most of the trim, drapery, light fixture and other cosmetic details, but we didn't replace any of our furniture. Between working with what we already had, trying to lighten the room but keep the walls in their natural state and dealing with the awkward layout, this room has been a huge challenge for me. But in the end, I'm happy with how it turned out. It still feels warm and cozy, but hopefully a little fresher. My goal in renovating our house is to make everything flow from room to room, but still let each room have its own personality. The original owners had painted the entire downstairs a cream color that neither Justus or I cared for and gradually we've been replacing it with white. I painted all the trim in this room and the ceiling the same color white (Simply White by Benjamin Moore) to match the rest of the changes we've made downstairs, but I also brought in some touches of gray, as the white can be a little stark against the wood. See the piece of trim in the corner? The original owners had trim in these corners painted white. One day it occurred to me that a piece of trim stained to match the walls would look so much better. It was just a little thing - but something we felt dramatically helped. I used a stain that Rust-Oleum had told us about (Ultimate Wood Stain - One Coat Color) and I loved it! Only one coat is required and that is literally all it took on the pine trim to match the oak walls. A lady I used to work with illustrated the two bird prints that hang in this corner and I absolutely love them. Originally I felt like I needed to add more, but I think their simplicity actually looks nice. We've had this table that sits under the window for several years. I found it at an antique store for about $40... the surface was made with two old cabinet doors. Finding a room arrangement that worked was one of the hardest things for me. I can't tell you how many times I moved it around! I am a symmetrical person and the front windows do not line up with the fireplace, which drives me a little crazy. In the end, I chose to line the sofa up to be symmetrical with the fireplace. Another thing I struggled with was a light fixture! I wavered between a schoolhouse light and a barn light for a long time, but in the end, Justus picked out this glass light fixture from Lowe's. It's not something I would have ever thought of, but it was just perfect. The pillows on the couch (and on the leather chair above) were made by Ann of On Sutton Place out of grain sacks (you can read about them here). They were one of the final touches that just brought the entire room together. The console table behind the sofa was also something we've had since our early years of marriage, but I painted it a lighter gray to help lighten the room (you can read about it here). We also added drapery panels, which are sewn from linen (you can read about them here), and rods. The shelves were another new addition (you can read about them here). I like the way they fill this empty space without taking up any precious floor space. I painted them the light gray (Titanium by Benjamin Moore) for a subtly softer look. Painting the stairs was a huge undertaking. Once the ceiling was raised, Justus was able to remove the piece of trim on the bottom. The above picture was taken on our first walk-through... the stairs were painted a brown color and were so slippery. After Jillian and I both slipped and fell down them in the same week, I had carpet installed two days later, and I've never once regretted it. I painted the top of the treads and the handrail the same gray as the shelves and the rest white. I actually painted the stairs a couple months ago, but I found they didn't hold up very well, so just last week I applied a coat of satin poly over the paint to help protect them. At first I tried painting our door gray too, but in the end, I decided white looked better and I repainted it. The door is original. Are you getting a feel for how awkward this room is? I needed to keep this walkway as open as possible, as it leads from the front entrance into the dining room, but still try to accommodate our furniture. In the end I put this checked chair up against the wall and the wooden crate beside it holds some toys. Just last week I was still struggling with what to hang in this corner. My mom had painted this wooden quilt square for their home, but wasn't happy with it, and asked if I wanted it. It fit just perfect in this spot! We replaced an outdated lamp shade here with a burlap drum from Lowe's. The fireplace doesn't look all that different. I repainted it the same light gray I've used around the room, as the white was just too much against the wood. I put up the same artwork (made from wool) and for now the mantle is simply decorated. The basket of blocks in front of the fireplace was a gift from a previous boss for our girls. As you can imagine, most of the time blocks are scattered around the living room floor (smile). Thanks for letting me show you around! I hope you'll forgive me for talking so much! One last thing... there is still time to enter the grain sack giveaway from Ann's shop (you can find that post here). Have a wonderful rest of the week! I am so happy to introduce you to my friend, Ann, today. I consider Ann my friend, but I've never actually met her in person - we met through our blogs! 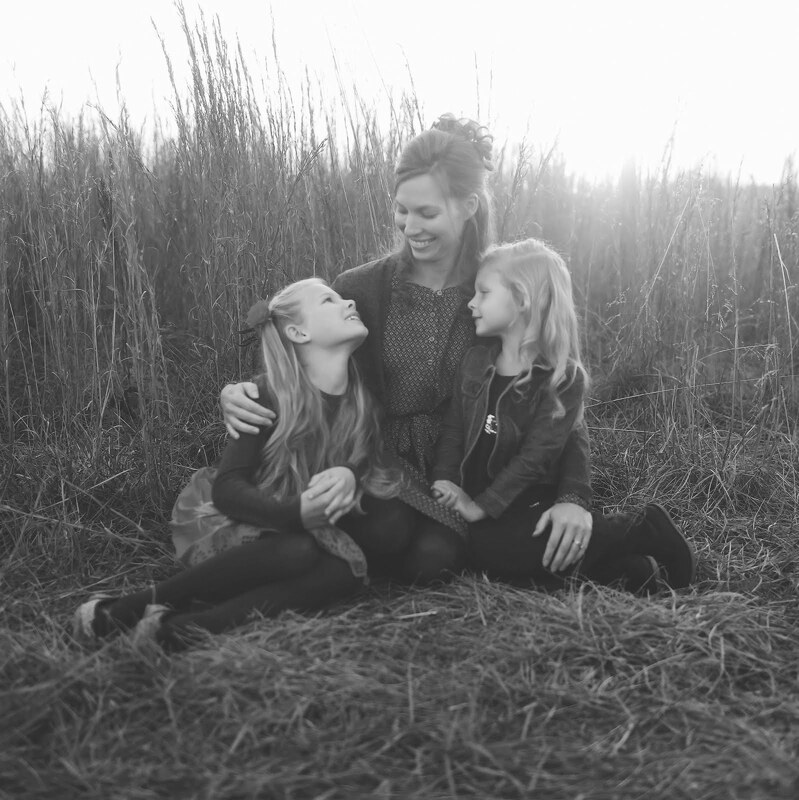 One day I clicked over to her blog and instantly felt at home. She so warmly writes about her beautifully decorated home, shares delicious recipes and other snapshots into her life. 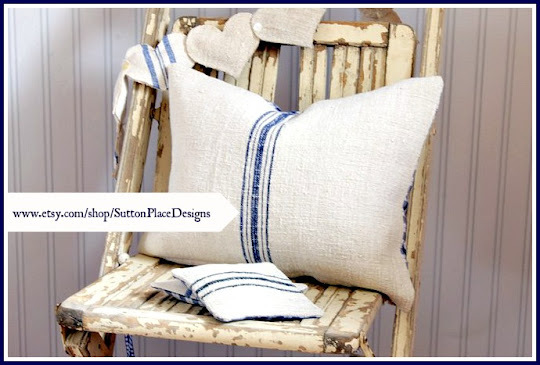 As I began to follow her blog, I also discovered her lovely Etsy shop, Sutton Place Designs, where she sells handmade textile items, like pillow covers and table runners. I particularly loved her antique grain sack items and one day I decided to treat myself and bought some of her grain sack lavender sachets (which to this day are still one of my favorite things). So along the way, a friendship was made... and her thoughtfulness has meant so much to me, from sharing blogging advice to sending me a surprise gift (grain sack stockings) in the mail. A while back, as we were finishing up in the living room and I was on the hunt for the right fabric to use for pillow covers, I could not stop thinking about how perfect red striped grain sack covers would look on my red couch. One day I simply couldn't resist any longer and I sent Ann an email (smile). So today I want to tell you a little about my grain sack pillows. Getting a package in the mail from Ann is pretty exciting... first of all, the contents always smell like lavender (even when they don't contain any) and each item is beautifully wrapped in tissue paper and always perfectly folded and ironed. My first question to Ann when inquiring about the pillow covers was, "How family friendly are grain sacks?" She responded that they were very family friendly and also machine washable... "Don't forget where they have been", she reminded me. And although I hate to admit this (particularly since it brings back memories of near-panic), I have already had one incident involving a little girl named Rosetta and a pillow cover. So I can completely assure you that some gentle scrubbing with a mild detergent and a gentle cycle in the washing machine will remove stains and your grain sack will look good as new. I can also assure you that although the lavender sachets are not hacky sacks, they will survive being thrown through the air on an occasion... or two. At first I started with two 20x20 pillow covers that Ann made specifically for my red couch. When I received this particular package and ran into the living room to see how they would look, I could hardly believe how well Ann had matched them. They were perfect. So for a few weeks I enjoyed my 20x20 covers on our couch, while struggling again to find a fabric for a small pillow on one of our chairs. And then Ann posted a picture on her Facebook page of her latest grain sack pillow, which was pieced together. Oh, I loved it..I must have looked at it in her shop at least 10 times. The size she had for sale was larger than I needed, so finally I couldn't take it any longer, and I asked if she would make me another pillow cover sized 12x16. This cover has a button closure on the side and a coordinating fabric inside. I love that it's a little different from the larger covers, yet still coordinates beautifully. And just to show you how thoughtful Ann is... her last two packages to me have included a little surprise for my girls. With the large covers (before Valentine's Day) she included two little grain sack hearts filled with lavender, one for Jillian and one for Rosetta. As you can imagine, Jillian squealed when she saw she had her own little heart. "And it smells soooo good, Mommy!" Ann has so graciously put together a wonderful giveaway package for one Keeping It Cozy reader and I am so excited that one of you will be the recipient of Ann's beautiful work! I know you will love everything just as much as I do. 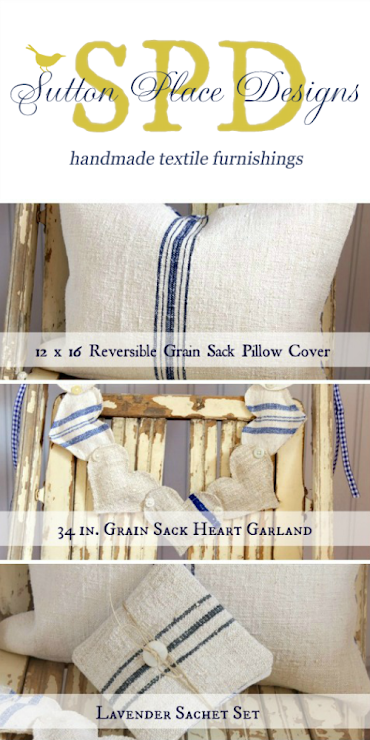 The randomly drawn winner will receive (1) 12x16 reversible grain sack pillow cover, (1) 34" grain sack heart garland and (1) grain sack lavender sachet set, all as pictured. I really like to keep my giveaways easy, so all that is required is leaving a comment, but I would love it if you would visit Ann's Etsy shop (click here) and let me know what your favorite item is when you leave a comment! Have a wonderful Monday! The giveaway is open until next Monday, March 18.